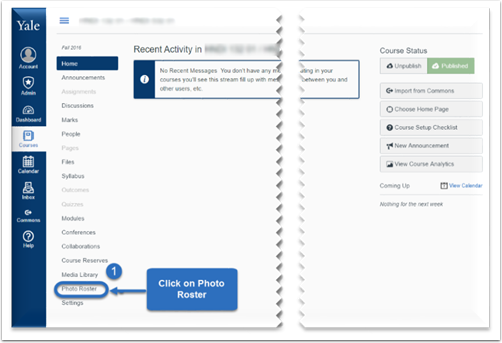 Within your Canvas course site, you will see that you have two roster tools: People and Photo Roster. This guide is designed to help you understand the differences uses of each tool. People Tool: This is the Canvas designed roster tool. By default, students will be able to see this tool and can see other people on this list. Photo Roster: This is the Yale created tool. Only individuals with the roles of Instructor or TA will be able to see this tool. Although other roles can see it on the course site navigation, it will appear blank and no student information will be provided. 3. This will show you roster without photos, but will include information such as their graduating year, Residential College, and major. 4. You can export the roster, including the additional information here by clicking “Export”. For more information on the People Tool. Please visit the vendor guide found here.